SAN FRANCISCO Crushing Grandma into a diamond. Rocketing Dad's ashes into space. Sprinkling's Mom's remains along a mountain trail with flower seeds. Behold the growing world of creative cremations. A torpid economy, declining religiosity and a modern trend toward simplicity has driven the number of cremations in America to 41 percent of all deaths - up from 30 percent just eight years ago, and a tiny 4 percent in the 1960s. And while that has reduced the number of mortuaries and traditional funerals, it's inflated the alternative market as never before, from do-it-yourself choices to things that might have seemed too bizarre to consider just a few years ago. LifeGem is a sparkling example. For $3,000 a pop, mourners at the Alta Mesa Funeral Home in Palo Alto can turn their loved ones into a genuine diamond - usually about a quarter carat at that price. 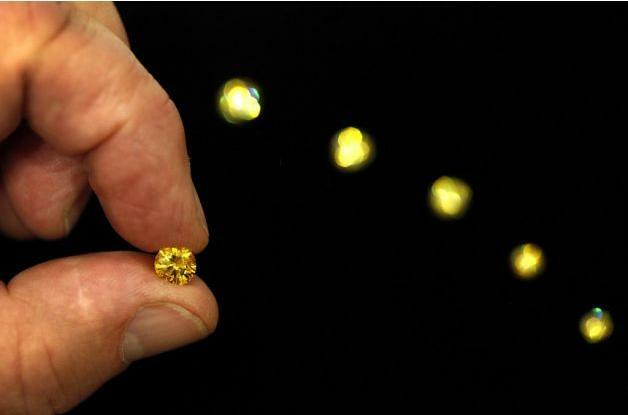 A full carat can cost north of $25,000. "Some people say, 'Oh no, I would never do that!' And others say, 'I absolutely want that,' " said Alta Mesa funeral home manager Don van Straaten. "It's a very special way of remembrance." Creating the diamond requires sending 1 cup of cremains to LifeGem in Illinois, which then takes up to a year to heat and pressurize them into a diamond. The gems come in blue, yellow or clear, and can be worn or propped on a mantle. Interest has steadily grown since the company's founding a decade ago. "The people who get LifeGem run the gamut from very wealthy people who want a memento of Grandma and Grandpa to families that have to take a while to scrape the money together," van Straaten said. "They just want an everlasting keepsake - and a diamond is forever, you know." LifeGem, takes the carbon from cremated remains and grows a diamond crystal with it. The longtime publisher of Mortuary Magazine says changes in the $12 billion funeral industry can be tagged to factors far deeper than recessions, which come and go. 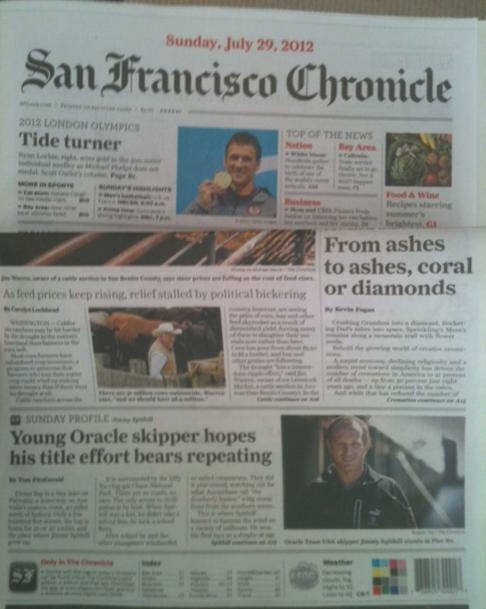 "People are increasingly looking for simple methods of honoring the departed, not more elaborate ones," said Publisher Ron Hast of Tiburon. "The big funerals in big churches, we just don't see them as much as we used to. And because cremations are so common now, that has led to fewer people needing graves." The General Social Survey reports that 22 percent of Americans never attend religious services, up from 13 percent in 1990. "People feel their golf clubs, yacht clubs or similar organizations are their new church replacements for holding services," Hast said. "People are going far more toward a celebration of life instead of the ceremonial aspects involving the body, like a funeral with a casket." Mary Hickey's contribution to this funereal landscape is selling packets of forget-me-not flower seeds with cards and bookmarks. The idea is to bring a card to a memorial service, or use a bookmark when reading from a Bible or similarly appropriate book at the service, then later honor the dead by spreading life in the soil. Hickey co-founded Next Gen Memorials in San Francisco 10 years ago, offering urns and other products, but, in the past five years, the seed packets have become her hot sellers, shooting from 100 a day to 1,000 at under $2 apiece. "I like to say I put the 'fun' in funerals," Hickey said. "Why not celebrate the life that was lived more than the death? "You can plant my forget-me-nots at a grave, in your garden or, if your loved one liked to hike, you can take them out and plant them along the trail and scatter the remains with them." 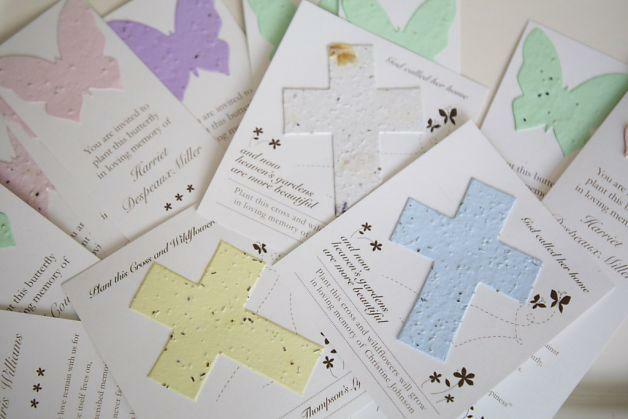 Shirley Krenzke of Racine, Wis., handed out Next Gen bookmarks when she buried her mother-in-law in February, and she made a special point of getting the ones with a seed-filled paper butterfly that can be peeled off and planted. "My mother-in-law collected butterflies and loved to read," Krenzke said. "We're all personalizing our services in ways we never would have thought of years ago, and those bookmarks were perfect." Also in the mix for creative memorials is Eternal Reefs, which plants artificial coral reefs with cremains, and Celestis, which takes the term "dearly departed" to new heights by shooting ashes into outer space - or, for a premium of $10,000, they'll slam the ashes straight into the moon's surface. 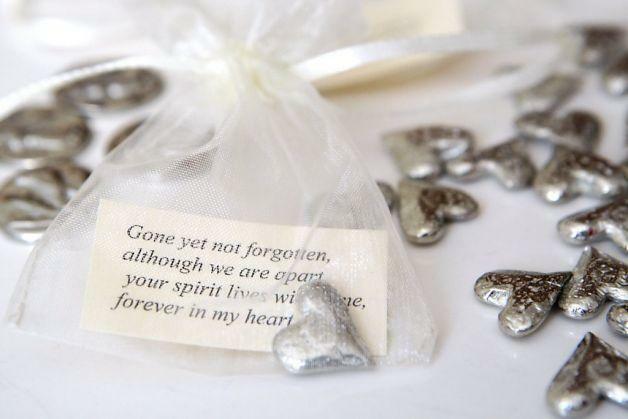 Thumbies will stamp a loved one's fingerprint onto pendants or pocketknives, and Eternity Message will let the someday-to-be-departed send mourners letters by e-mail to be dispatched up to 60 years after death. Robert Barrows of Burlingame hopes to capitalize on the evolving zeitgeist by making homes and cemeteries a little louder with his Video Enhanced Gravemarker. Barrows' invention would let mourners record hours of videos and then plant them into any kind of marker they like - tombstones, urn bins or even toys. The person being memorialized could film himself, or home movies and tributes could loop. The grieving could even cobble together unflattering portraits if they wanted to get the everlasting last word. A smaller form of this already exists back East, and some tombstones even sport QR codes that let mourners connect to memorial websites with a swipe of a cell phone. But Barrows said his grave marker - preliminarily priced at about $30,000, with upkeep contracts - would transform graveside or mantle moments into cinematic celebrations. He's pitching it to investors. "A guy could say, 'I'm 55 and I'd like to record 10 minutes a year and make that my life story for everyone to hear after I'm gone,' " Barrows said. "Or, in case you had an affair, you could time the video to run after your kid is gone so they never have to find out. Jessica Koth, spokeswoman for the National Funeral Directors Association, said the decline in the number of funeral homes in America from 21,757 in 2002 to 19,680 today reflects the new trends. But that figure also probably is due to a dip in the nation's death rate, she said - and that is about to change. The death rate dipped from 8.5 per 1,000 population in 2000 to 7.9 in 2009, but over the next 20 years, as the swollen Baby Boomer population dies off, the rate should rise to nearly 9 per 1,000, according to projections by the National Center for Health Statistics and the U.S. Census Bureau. "With the rate going up, it's hard to say if the current number of funeral homes will be enough," she said. Even do-it-yourselfers can use a little planning help from a professional undertaker, she said - whether it's picking the right cremains diamond or selecting a tried-and-true casket. "We'll just have to see," she said. "There are so many new options people have come up with, and funeral directors can really help you sort them out."